Che Guevara was a thug. He was a brutal murderer, a racist, and an organizer of execution squads. But he makes a great t-shirt icon if you are truly clueless. As we all know, a lot of celebrities are indeed clueless, despite the super-megaphones they wield. So it's no surprise to see some celebrities sporting Che Guevara shirts in an attempt to wear their coolness and feel like they'd fit in with a dorm room full of Trotskyites. Below are the Top 10 celebrities that have been spotted wearing Che material (in ascending order of social influence). In no way is this list meant to imply there is any level of coolness to those who wear Che. He was a thug. Wearing him means you are clueless, a communist or a brute. There is no hipster coolness to it, despite what any cool hipster will tell you. 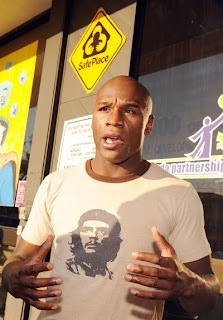 (10) Floyd Mayweather Jr. - the boxer has had trouble in his life, but the t-shirt exonerates all of his wrong-doings. 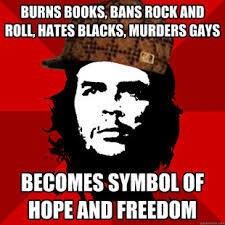 Che was magical that way. (9) Cristina Fernandez de Kirchner - Only slightly more influential than Mayweather, the Argentinian leader and friend of president Obama has been a supporter of Che. Here she carries a sign of support. A red badge of scourge as it were. (8) Carlos Santana - the guy whose most memorable hit Black Magic Woman was not even his own song (Fleetwood Mac originally recorded it) wears a shirt of a man who take away the millionaires wealth in a heartbeat. Smooth. 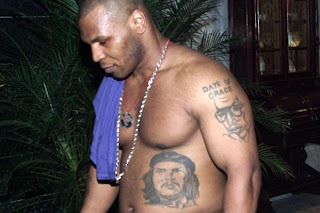 (7) Mike Tyson - To be fair, Mike Tyson may not know he is wearing a tattoo of Che. 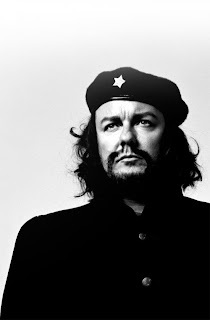 (6) Ricky Gervais - the Godless heathen and apparent socialist Brit comic would rank higher if The Office were still on the air in either England or America. Wearing the t-shirt isn't enough for Gervais, he's adopted the look on occasion. Then again it may just be an attempt to look much cooler than the dumpy guy he is. Whatever works for you Ricky. 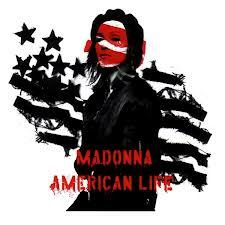 (5) Madonna - speaking of irrelevance and of dressing up as Che, Madonna achieves both. 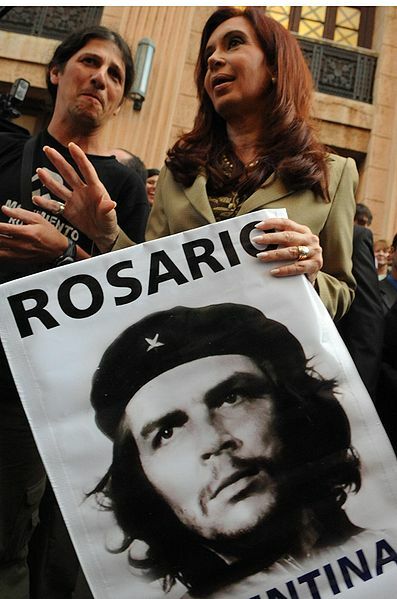 Though it's not fair to blame her irrelevance of Che. That happened sometime around Holiday. (4) Prince Harry - Really? Teenage rebellion from someone who is likely the richest grandson on the planet is laughable. 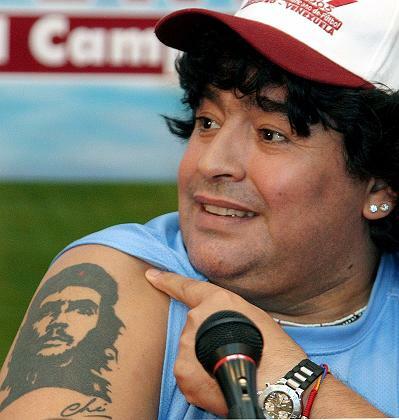 At least it wasn't an Argentina shirt. Malvinas! (3) Robert Pattinson - It's not enough that he's a vampire, but teenage girls around the world will become Che devotees because of something like this. 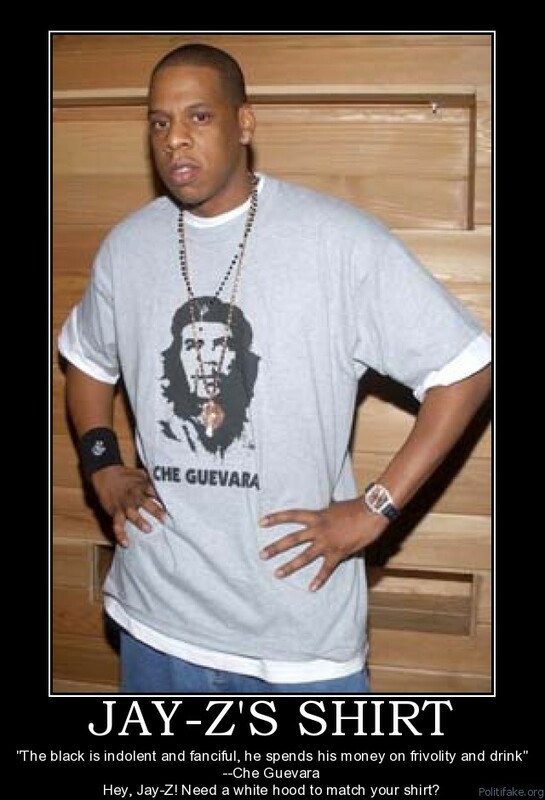 (2) Jay Z - the rapper is no stranger to communism. 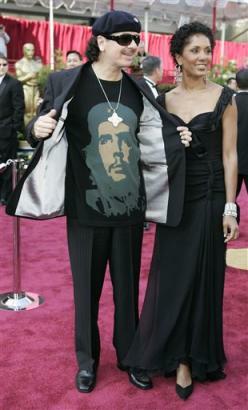 The irony with Jay Z wearing Che is that Che would have killed Jay Z for his money, oh and Che was a racist. 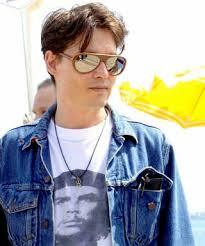 (1) Johnny Depp - Really Johnny? You didn't think you were cool enough, or eclectic enough that you felt the need to go Che? Johnny recently moved back to the US from France to avoid the high taxes in France. 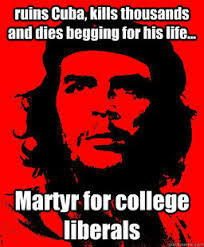 I wonder what Che would say about taxing the rich? Useful idiots as the communist expression goes. 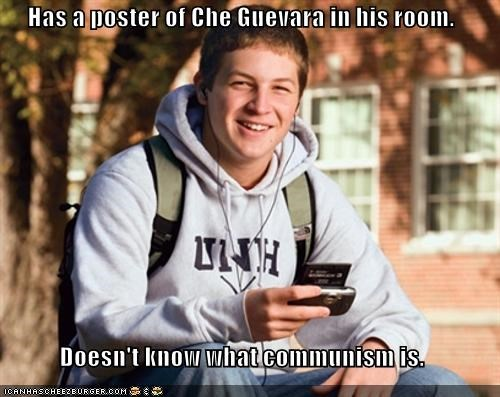 Che would have a slightly different take.